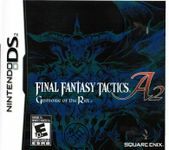 "Final Fantasy Tactics A2: Grimoire of the Rift​ (ファイナルファンタジータクティクス A2 封穴のグリモア, Fainaru Fantajī Takutikusu Eitsū Fūketsu no Gurimoa, lit. "Final Fantasy Tactics A2: Grimoire of the Rift") is a tactical role-playing game developed and published by Square Enix for the Nintendo DS handheld game console. Grimoire of the Rift is the sequel to Final Fantasy Tactics Advance as well as an iteration in the Ivalice Alliance. Grimoire of the Rift uses an isometric turn-based tactics battle system. However, Square Enix further developed the game's grid-based system and increased the number of character jobs. Some enemies also appear in larger sizes, taking up multiple squares on the grid. The world map has also developed, with the introduction of "area maps". The area maps feature multiple battle locations and a town, which work similar to its predecessor. Enemy clans also travel the world map. The game differs from previous Final Fantasy Tactics games because one chooses specific missions from a screen. Some missions are central to the story and can be replayed until successfully completed. There are over 300 other missions in the game that may be replayed in order to level up the player's team. There are also random battles against creatures that occur on the map, which one can choose to fight." Source: Wikipedia, "Final_Fantasy_Tactics_A2:_Grimoire_of_the_Rift," available under the CC-BY-SA License.